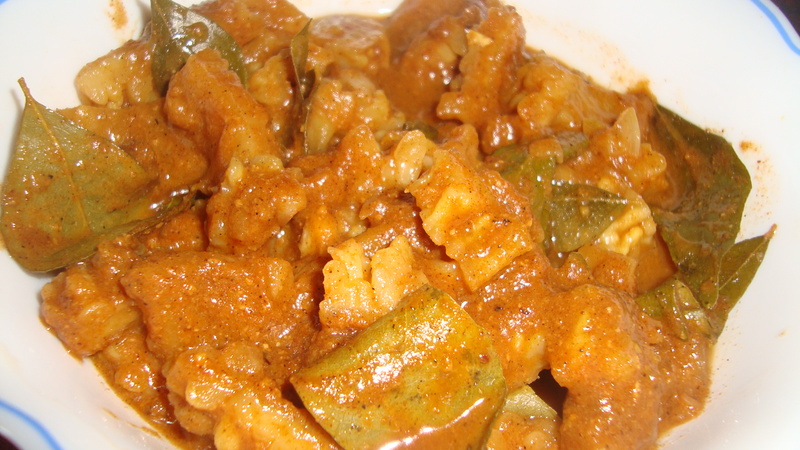 Today’s recipe is a slightly different variation of bitter gourd/ pavatkai curry that my mother makes. The recipe for the more common way that my mother makes this dish is given in this earlier post. Continuing with my sharing of Indian movie songs, today I would like to feature one of my mother’s favourite singers – S.Janaki and a few of the songs I like of hers. Janaki was born in 1938, started her musical training at the age of 3 and her movie musical career in the latter part of 1950s. According to my wikipedia source, she has sung around 20,000 songs in various Indian languages and won state and national awards for some of them. She made headlines last year when she refused to accept the Indian government’s prestigious award – the Padma Bhushan. The first song here is from K.Balachander’s movie Varumaiyin Niram Sivappu (translation: The colour of poverty is red, 1980) starring Kamal Haasan and Sridevi. The music composition is by M.S. Viswanathan (MSV), who was more popular between the 50s to 70s. The singers are SPB and S. Janaki. I couldn’t resist sharing another song from one of my favourite movies, Salangai Oli/ Sagara Sangamam (1983) whose music was composed by Ilayarajaa. This time it is a solo song by S.Janaki and the two actors/ dancers, Kamal Haasan and Manju Bhargavi, in the song are trained classical dancers. The last song is a relatively more recent song from the movie Sangamam (literal translation: Confluence, 1999) and the music was composed by A.R.Rahman. The singers are Janaki (lead vocalist), Unnikrishnan and Madhumita. Hope you enjoyed the movie clips and do try out this bitter gourd recipe! Wash and cut the bittergourd into small pieces. Keep aside. Chop the chillies and onion. Lightly fry them in a tablespoon of oil in a pan. Add the chopped bittergourd to the pan and continue frying for a few minutes. Add the tamarind juice and salt to the pan. Cover and let it simmer for around 10 to 15 mins until the curry thickens. Chop the tomato and add it to the pan together with ¼ coconut milk. Add a tablespoon of sugar and salt to taste. Cover and cook for another 15 mins. 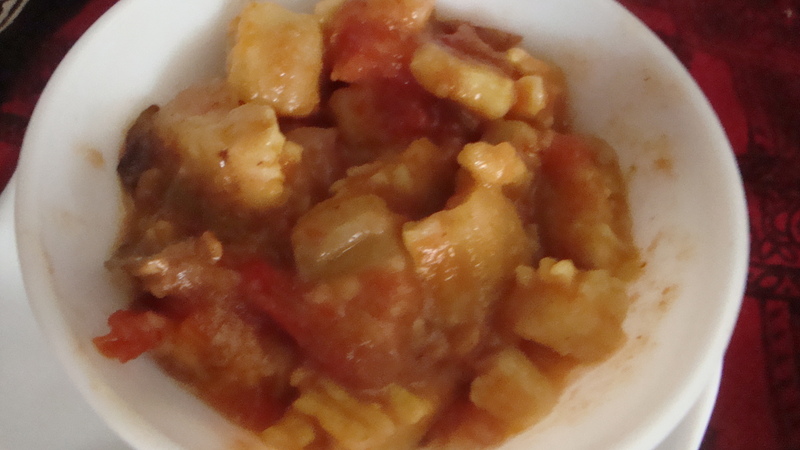 The other recipe for today is also a bitter gourd recipe of my mother’s. 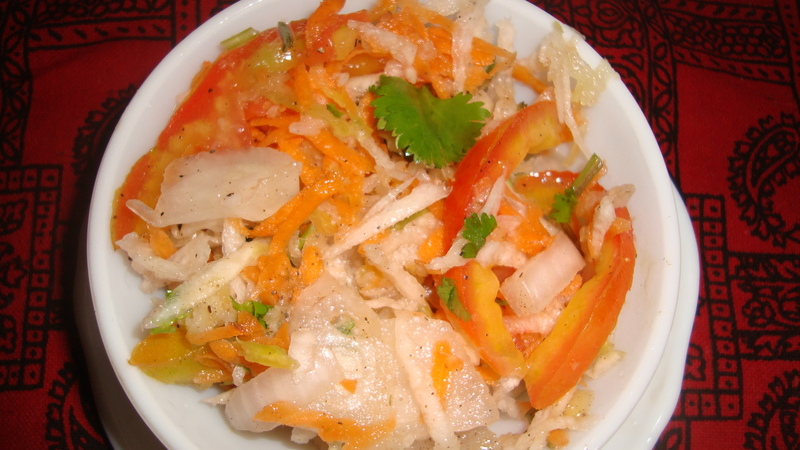 Add some salt to the bowl of chopped bitter gourd and carrot pieces and keep aside for about 5 mins. Heat ½ tbsp oil in a pan and fry the fennel seeds. Add the curry leaves as the seeds start to splutter and immediately add the chopped onions, green chilli and capsicum or malu miris. Fry the onions and chillies for about 2 mins. Add 1 tbsp of oil and the salted bitter gourd and carrot pieces. Cook for about 10 mins, on low heat, stirring continuously. Add the sliced tomatoes and cook for a few minutes. Add ½ tsp of crushed chillies. Mix well and cook for a minute or two. Just before removing from heat, add ½ tsp sugar and mix well. 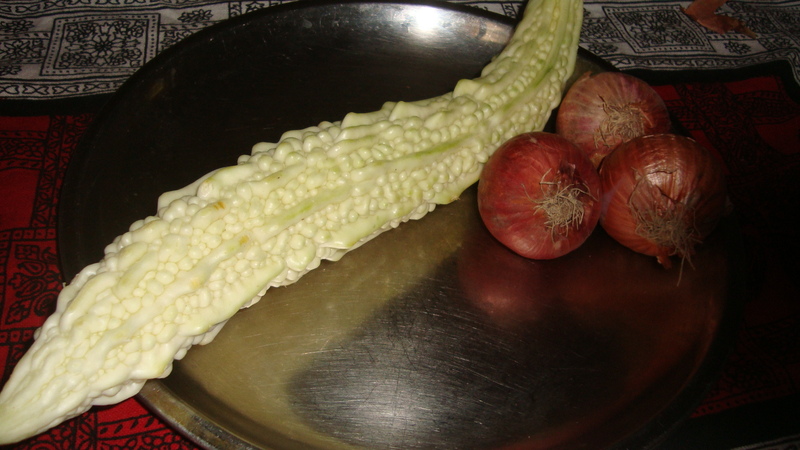 Cook the chopped bitter gourd in water, in a pan, for about 5 to 10 mins on medium heat. Add the tamarind extract, curry powder, curry leaves, chopped onion and salt to taste to the pan. Let the ingredients combine and simmer on low heat for about 15 to 20 mins. 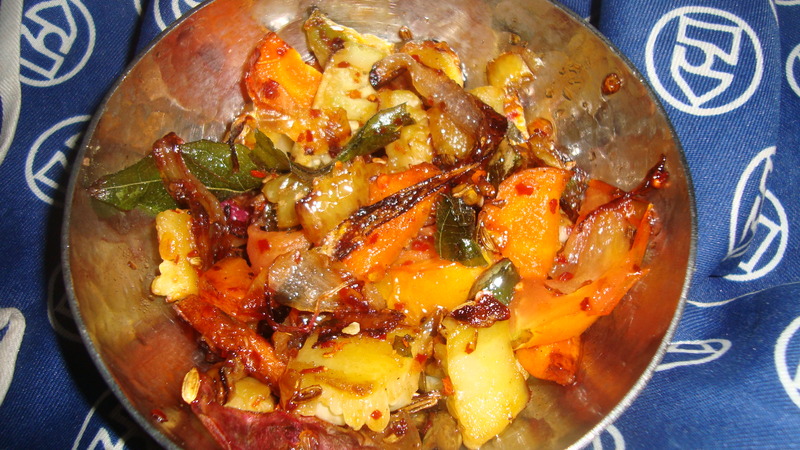 If the bitter gourd is not tender enough as the liquid starts drying up, add ½ cup of water. Add ¼ cup of coconut milk or non-fat milk and a tsp of sugar. Mix well and let the curry simmer for another 5 to 10 mins on low heat.